LITTLE ROCK, Arkansas, June 14, 2013 (ENS) – The United States and the State of Arkansas Thursday filed a joint enforcement action against ExxonMobil Pipeline Company and Mobil Pipe Line Company in federal district court in Little Rock. The civil complaint addresses ExxonMobil’s illegal discharge of heavy crude oil from a 20-inch-diameter interstate pipeline, known as the Pegasus Pipeline, that ruptured in Mayflower, Arkansas, on March 29. A segment of the Pegasus Pipeline ruptured in a residential neighborhood of Mayflower, a town of 2,300 people about 25 miles northwest of Little Rock. The pipe was buried about two feet below ground as it traversed the town. The oil spilled from the ruptured pipe directly into the neighborhood and then into nearby waterways, including a creek, wetlands, and Lake Conway. The waters of Lake Conway flow into the Arkansas River. 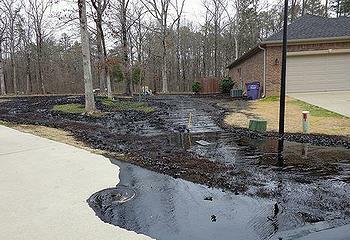 The oil has contaminated homes, land and waterways and impacted human health and welfare, wildlife, and habitat. Twenty-two families were forced to evacuate their homes due to the hazardous conditions in the neighborhood resulting from the spill. Cleanup efforts are still ongoing, and six weeks after in spill, most of the evacuated residents have not been able to return home. The Pegasus Pipeline runs 850 miles from Patoka, Illinois, to Nederland, Texas. Now used to transport heavy crude oil from the tar sands of northern Alberta, the pipeline was constructed in the 1940s. On March 29, the pipeline carrying Canadian Wabasca heavy crude from the Athabasca oil sands – bitumen mixed with hydrocarbon diluents, a mixture known as dilbit. The complaint alleges six causes of action against the defendants. The United States, on behalf of the U.S. Environmental Protection Agency, seeks civil penalties and injunctive relief under the federal Clean Water Act for the oil spill. The state of Arkansas, on behalf of the Arkansas Department of Environmental Quality, seeks civil penalties for violations of the Arkansas Hazardous Waste Management Act and the Arkansas Water and Air Pollution Control Act. This charge relates to the tons of waste soil, oily debris, hydrovac mud, concrete and asphalt mixed with oil and water removed from Mayflower and stored at a site on Highway 36 in Conway, Arkansas. These waste materials were supposed to have been cleared away by May 8, but they are still present at the site. The state also seeks a declaratory judgment on ExxonMobil’s liability for payment of removal costs and damages related to the spill under the federal Oil Pollution Act.